Sabra's SSM-1/SL Universal Microphone Shock Mount delivers low-cost acoustic isolation for the clear, classic sound you want. It is one of the most popular mounts for choir rooms, rehearsal studios, and radio broadcast studios around the world. Acting as a filter for low-frequency signals, it is capable of reducing mechanical noise by up to 15 dB. Use with an impressively wide variety of mics, up to 2" in diameter. The SSM-1/SL's speed lock mechanism mounts and dismounts the shockmount with just a 1/4 turn. Braid-covered, high-quality elastic bands help to eliminate mechanical noise that often radiates through the mic stand, or boom pole, and distorts your sound. 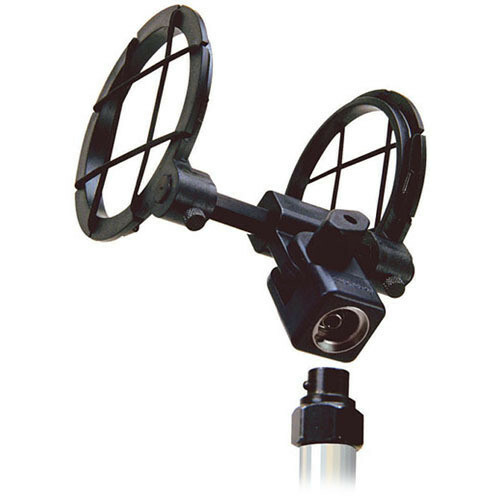 Standard 5/8" threading makes it easy to attach the shockmount to a boom pole or mic stand. Say goodbye to those preventable recording setbacks. Box Dimensions (LxWxH) 9.7 x 6.1 x 1.5"